Definition: Devices/mechanisms which require the use of a torsion spring in order for the application to function appropriately. Torsion springs are found in a wide variety of applications; many of which we use in our everyday life. These springs deflect in degrees and not in inches so they are used in applications which require them to travel radially, thus twisting its coils. Torsion springs have legs which your application’s mechanism will be pushing in order to produce the required torque. This spring’s coils are usually close wound but they may be made open wound so that the torsion spring will also work as a compression spring inside your application. The force (rate) of a torsion spring is measured in inch-pounds per degree and it greatly depends on the physical dimensions of such spring. The tighter the spring index and the less coils the spring has, the stronger and stiffer it will be. This means that you’ll have a strong spring but you might not have a flexible spring. This is why other values like maximum torque possible and maximum safe travel must be considered when designing a torsion spring for your application. You’re able to find torsion springs in several applications such as lids, gates, ramps, doors, etc. Anything that moves rotationally can have a torsion spring as either a lift assist or an automatic retrieving application. 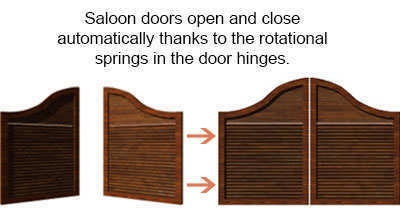 For example, the torsion springs in a door hinge application allow for the door to close automatically after you’ve stopped pushing on it. On the other hand, the springs on a trailer ramp application will not necessarily close the ramp automatically but, because the ramp is heavy and the torsion spring has stored energy due to deflection, it will assist you in lifting this ramp. These springs will usually work in parallel in order to lift these heavy applications. In the case of the trailer ramp, you might need to have 2 to 4 torsion springs assist the lifting of such. If it were to only be one spring, it would either be under a lot of stress thus not allowing you to travel the required distance or it might have to be quite large thus not fitting properly when installed. Several design and shopping tools are provided to you here, at Acxess Spring. If you’re looking to design a spring, buy small quantities or large quantities of either stock or custom springs, we have all the tools necessary to help you do so. We know that not everyone interested in buying springs is a spring engineer so we’ve made these tools extremely easy to use and user friendly. Every one of them includes instructions, easy step by step processes, and how to measure diagrams so you’re able to identify your spring’s dimensions. With Spring Finder, you’re able to search for stock torsion springs using tolerance ranges so you’re able to find springs within your parameters. With Instant Quote, you’re able to get a custom quote for a specific spring design. Both of these shopping tools are included in the most advanced and simple torsion spring design application; Spring Creator allows you to generate a live spring design with blueprints plus it also includes the features of Spring Finder and Instant Spring Quote so, while you’re working on a design, you will also get suggestions of similar springs in stock as well as a live instant quote to have that exact design made specially custom for your application. Spring Creator is now mobile as well. Download our torsion spring calculator on all of your mobile devices and take it on the go wherever you’re able to get an internet connection. It is available on both Android and iOS systems for your convenience. It is able to achieve all of the tasks it is able to do on our PC version as well. Click on the links below to download.